As a 24 hour emergency center, Jefferson Animal Hospital has seen the demand for blood products increase significantly over the years. Demand for this resource at times exceeds supply, especially during certain times of the year (like holidays, and warm summer months where trauma cases are more likely to be seen). When this happens, hospitals in need are sometimes placed on a waiting list, which can cause delays in treatment for pets in need. Our mission is to provide our patients, and the veterinary community, with blood products obtained and processed with the highest standards for safety and the ethical treatment of our donor pets. Read our "Does Your Pet Have What It Takes to Be a Hero?" 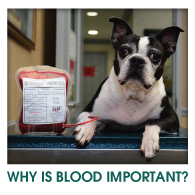 page to see whether your pet qualifies to be a blood donor to our pet blood bank. For more information, please visit our page "Why Is Blood Important?". 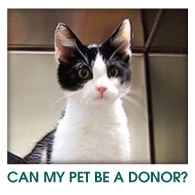 Can My Pet Be A Donor?